Any kitchen can be made kosher. Whether your kitchen is up-to-the minute in fashionable design or a relic of the 1920s, whether you have a spacious “great room” or a tiny galley kitchen, you can readily adapt it to kosher practices. How to Begin: Even before your kitchen is made kosher, begin preparing for the change. Buy only foods which are certified kosher. Begin to keep meat and dairy separate. Many people use disposable utensils just before going kosher. Remove all questionable foods. Before making the kitchen kosher, discard all foods prepared in the pre-kosher kitchen. 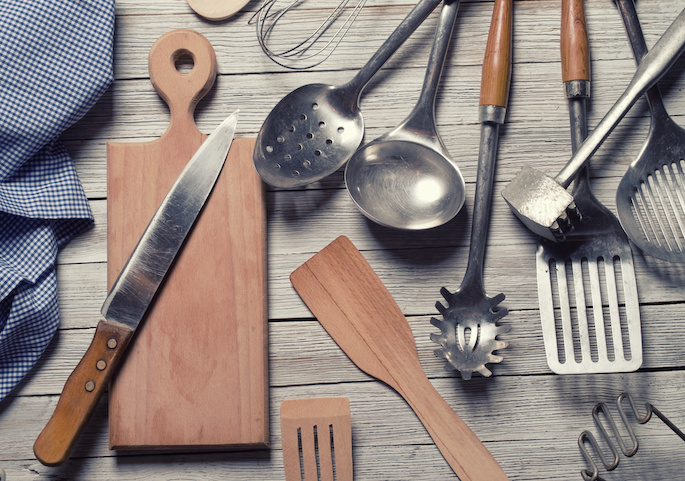 Inventory of Kitchen Items: One of the first things that the person who is helping you to become kosher will do is divide all the items in your kitchen into two categories—those which can no longer be used in a kosher kitchen, and those which can be used after undergoing the various procedures of koshering. Some new purchases will undoubtedly be necessary. New items may include dishes, some additional pots, plastic drainboards, and basins for the sink. Many dishes and utensils require immersion in a mikvah before being used. See Immersion of Vessels. Decide which cabinets you will use for the newly separated meat and dairy dishes. Labeling these storage areas is a good idea. Koshering Utensils: Many of the utensils in your kitchen will continue to be used after undergoing a process called koshering. There are several methods of koshering, including heating the item with a blowtorch or immersing it in boiling water. The method used depends upon the type of utensil and how it has been used. After deciding with your rabbi which utensils will be koshered, an appointment should be made for him to come and kosher your kitchen. See Koshering Appliances and Utensils to identify which dishes and appliances can be koshered and with what procedure. While a kitchen remodeled or designed for kashrut observance—with two sinks, two stoves, and separate working areas—is certainly a great convenience, it is by no means a necessity. “Milchigs” and “Fleishigs”: In keeping with the total separation of meat and dairy required in the kosher kitchen, separate sets of dishes, pots, silverware, serving dishes, bread trays and salt shakers are needed. These different sets should be kept in separate cabinets. Also necessary are separate sets of draining boards, draining racks, dish sponges, scouring pads, dish towels, and tablecloths. Dish soap, cleanser, and scouring pads used for dishes and pots must be certified kosher. One must be especially careful to mark utensils that look similar for both meat and dairy, such as knives, ladles or wooden spoons. Distinguish between such utensils by having a different color or design, or paint a line on the handles according to the color scheme. Plastic tape, color-coordinated signs, or paint of the same color may be used to mark other items. The separation of meat and dairy must be maintained throughout the kitchen. See Koshering Appliances and Utensils for instructions on how to kosher appliances that were non-kosher. 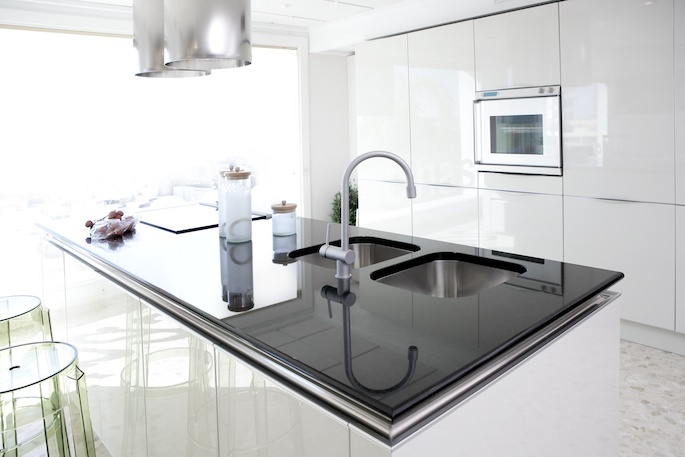 The Sink: Separate sinks for washing dishes and preparing foods are recommended. If the two sinks are adjoining, there should be an effective separation between them so that no water or food splashes from one sink to the other. If there is only one sink, it may be used after it has been completely cleaned, but the inside of the sink should be regarded as non-kosher. No food or dishes should be put directly into non-kosher sinks. There should be separate dishpans and slightly elevated racks under the dishpans for both meat and dairy. Similarly, two sinks which were used before the kitchen was kosher should also be regarded as non-kosher, unless they are stainless steel and were koshered. If the two sinks were koshered, one should be designated for meat and one for dairy. Tables: A table can be used at different times for meat and dairy if one uses different tablecloths or placemats. A new table or a table surface that was koshered can be used for one category, and a tablecloth or placemats used for the other. Countertops: Designate separate countertops or work areas for meat and dairy. If one area must be used for both, separate coverings must be used. Refrigerators and Freezers: These may be used for all food types. However, separate areas should be designated for meat and dairy foods. Sometimes a shelf or the door of the refrigerator or freezer is kept for dairy. If dairy is kept on a shelf inside the refrigerator, one should cover the shelf with aluminum foil or a plastic liner to prevent leakage onto other foods. If dairy drips on the foil, the foil must be carefully removed and replaced. Similar care must be taken with meat products inside the refrigerator. One should avoid placing hot meat or hot dairy foods in the refrigerator, as this may affect the other foods in the refrigerator and cause kashrut problems. The Stove Top: Where heat is involved, the laws concerning the accidental mixture of meat and dairy foods become much more complex. Therefore, strict precautions are taken concerning the use of the stove and oven for meat and dairy products. The ideal setup in the kosher kitchen is to have two separate stoves. A practical alternative is to use the full-size range for meat, and a portable gas or electric range or cooktop for dairy. Where one stove is used, separate burners designated for milk or meat use are preferable. If this is not possible, extra care must be taken to keep the burners very clean. It is best to avoid cooking both types of food at the same time, since the steam or food in one pot might splatter or escape to another, creating serious kashrut problems regarding the food and pots involved. If it becomes necessary to cook both meat and dairy foods in separate pots at the same time, utmost care should be taken that the lids are secured tightly at all times, and that an upright sheet of tin or other metal separates the pots. Be careful to avoid lifting lids of both meat and dairy pots at the same time. If the lids must be lifted to check the food or add any ingredients, raise the lid only slightly off the pots, tilted away from the opposite pots. It is best to have the meat and dairy pots well separated, to keep the steam or liquid from coming in contact with each other. The Oven and Broiler: It is best to use the oven for only one type of food: meat, pareve or dairy. If only one oven is available, the use of portable broilers or toaster ovens for other food types is advisable. Meat and dairy foods can never be baked or broiled in one oven at the same time, even in separate bakeware. If you wish to keep the oven pareve, then meat or dairy foods cooked in that oven (at separate times) must be tightly covered all around, including the bottom. It is advisable to place a piece of foil under the pan and to change it for meat or dairy use. The pan may be opened for testing only when it is completely removed from the oven. The oven, racks, and broiler are thoroughly clean. (It is helpful to put a piece of foil under the bakeware to ensure the cleanliness of the oven racks.) This might be difficult to achieve without a self-cleaning oven. Twenty-four hours have elapsed since the oven was used for meat. For example, if meat is baked in the oven, and then you wish to bake a cake which can be served with milk, first be sure the oven and racks are clean, then wait twenty-four hours before baking the cake. The same conditions apply if one wishes to bake pareve in a dairy oven. It is advisable to have separate bakeware for pareve. If the oven is clean, the waiting periods between milk and meat are not required for pareve foods baked in a meat or dairy oven. To use an oven for both meat and dairy at separate times, consult a qualified rabbi. All of the above also applies to broilers which are on the bottom of the oven. Regarding the use of self-cleaning and microwave ovens, consult a qualified rabbi. Portable Electric Broilers: These must be used for either meat or dairy exclusively, because they cannot be properly koshered. Small Appliances: An electric mixer, blender or grinder do not require a separate motor in order to be used for meat and dairy. However, one must buy separate attachments if the appliance is to be used for more than one food type (meat, dairy, or pareve). Even when using separate attachments, the machine should be cleaned well on all sides after each use. A Dutch oven is the same as any other pot, just with a heavier lid. As such, if it is of a kasherable material, it may be mashers, it is is ceramic or earthenware, it may not be. I have read this and similar many times, but nobody writes about the 10' × 8' kitchen (that includes sink, stove and refridgerator; 'door' openings and window) and tiny income to go with it. There is no room to spread the kitchen as the the flat/apartment has similar dimentions. Moving is not an option. Many people do not have a glamorous kitchen (my entire flat would fit in the pictured kitchen,) or space for 2 sets of... I do my best, but, it is a long way from ideal. I do not feel guilty. I feel it is so wrong papering or using disposables because of the environmental factor (& expense when every penny stretches). Presenting the ideal is text-book. Recreating it isn't always possible - then what? If a pareve utensil came in contact with hot or salty cheese, that utensil becomes dairy, and now may only be used with non-meat foods. You can kasher that utensil if you wish, or just leave it as a dairy utensil. If the cheese was cold and not salted, the utensil just needs to be washed. I want to mention that having pareve utensils is difficult in a kosher home. Most just choose either meat or dairy for each utensil and prepare foods with either meat or dairy utensils. Unfortunately not. Ceramic and earthenware cannot be kashered. To maintain a kosher kitchen, the first and most important element is to only allow certified kosher food into your house. Beyond that, however, the entire kitchen, eating areas and dishes and utensils must also be kosher.Some authorities require that the (stainless steel) dishwasher be given a thorough cleaning (including the strainer) and that separate racks must be used between meat and dairy cycles. This is the opinion of Rav Moshe Feinstein zt"l. For more practical or personal advice, please consult a halachic authority. Can a double stainless steel sink be used -- one side milk, other side meat? Re: Stainless steel Before discussing whether the bowl and blenders can be koshered or not, it is necessary to first determine if they ever became fleishig. In order for a dish or utensil to become fleishig, it must first absorb some of the flavor of the meat stored in it. Absorption only takes place by way of a medium that can transfer flavor. Typically, heat is such a medium. So long as the bowl and blender were only used for cold meat, they will not absorb any flavor. When later washing the bowl, if the water used was above 110° F, the halachic heat required for absorption, then the flavor of the residue of meat left in the bowl will become absorbed into the bowl, and it will need to be koshered. If the water did not reach this temperature, the bowls do not need to be koshered. In general, the custom is not to kosher dishes from meat to milk and vice versa, because it may lead to confusion. If a person only has one set of dishes, and is constantly transferring them from one to the other, there is a good chance he may forget what the current status of the dishes is, and it may create problems. If, however, one is transferring them only once, and intends to use them from now on for that purpose, it is permissible. Veggie milks I'm not a vegetarian or a rabbi but I am allergic to "real" milk. There are many veggie milks that are both kosher and pareve (non-dairy according to kosher criteria). However, some "vegetarian" products are not dairy-free (or meat-free) by kosher standards. You need to look for a kosher symbol from a reliable kosher supervising organization (OU, OK, CHK, etc.) Beware of just a K; according to American law there's no restriction on putting a letter of the alphabet on the product, so a K may mean anything or nothing. If the veggie milk is supervised to be kosher, be sure it is also marked "pareve" (non-dairy by kosher standards). Some "veggie" milks are made in dairy equipment or contain sodium caseinate, which is a derivative of milk. So in kashering, I am a po' boy so I have only 1 oven and one sink. Now in kashering, do you start with the sink? If you boil water and put it in your sink, must you wait a day before you use the sink and the water in it to clean everything else (pots, forks, etc.)? Ultimately, is there an order of operations? And waiting times/stop and go?